The 2016 DBIP is substantially complete as of November 16, 2016. Beginning as early as May 18, 2016 construction will begin on the Downtown Boise Implementation Plan (DBIP) project on Jefferson Street between 16th and 1st streets. Construction is scheduled for completion in November. This project is substantially complete as of 10/15/15. New changes are coming to the streets of Downtown Boise this summer. The Ada County Highway District is working to bring transportation improvements to the downtown core. Construction will begin the first part of August and is expected to be completed by the middle of October. Crews will complete as much of the work as possible at night to minimize impacts to traffic. Crews will potentially work 7 days a week, either from 9 a.m. to 4 p.m. during the day, or from 8 p.m. to 5 a.m. at night. Crews will not be allowed to impede traffic between 6 a.m. and 9 a.m. and from 3 p.m. to 7 p.m.
On Wednesday, June 4, 2014 ACHD Commissioners ended the pilot, and asked ACHD staff to work with interested parties on a strategy for bicycle facilities in downtown Boise by the end of August. ACHD crews began removing the road markings that created the demonstration lanes over the weekend and will continue the removal through June 12th. ACHD measured a 20-percent increase in travel time on Main and Idaho streets -- but no traffic jams occurred -- but the District heard from many citizens who said they experienced backed up traffic and from Valley Regional Transit, which said its bus drivers experienced three to five minutes of increased travel time getting through downtown at peak times. Although more cyclists were counted using the lanes, the increases were not deemed to be worth the tradeoffs in terms of appearance, traffic flow and decreased street parking. The stakeholders group will include ACHD, the City of Boise, the Capital City Development Corporation, the Downtown Boise Association, Valley Regional Transit, and others. Information gleaned from the 30-day pilot project will help the group examine parts of the project that were successful, as well as areas that may require a different approach. Those recommendations will be brought back before the ACHD Commissioners in August or September. In May, the Ada County Highway District (ACHD) converted one traffic lane to a buffered bicycle lane on Capitol Boulevard, Idaho Street and Main Street for at least a one-month trial. This will give motorists, bicyclists, and traffic experts an opportunity to "try on"Â the proposal before considering a permanent change. 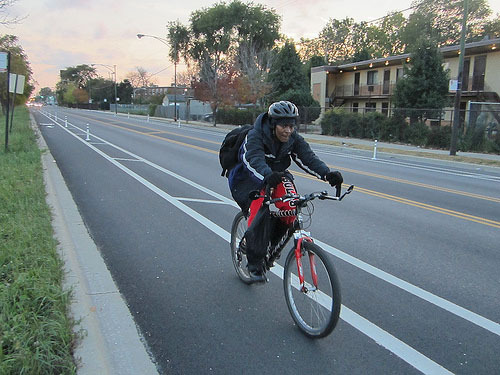 The City of Boise requested that the lanes added to the streets to increase bicycle safety and connectivity downtown and urged ACHD to implement the change. Curious about the impact to downtown Boise of such a major shift, the ACHD Commission approved the demonstration to gauge the feasibility of the proposal. For the May 2014 demonstration, the buffered bike lane was an area for cyclists separated from the vehicle travel lanes by painted striping and vertical markers, and occasionally a vehicle parking lane. See an example below. A bike box is an intersection safety feature to prevent bicycle/car collisions, especially those between drivers turning right and bicyclists going straight. Please click on the image below to view the written display boards from the open house. To view the maps, please see "Related Documents" to the right. The Downtown Boise Implementation Plan was adopted by the ACHD Commissioners on Wednesday, September 25, 2013. Please click on the image below to view the display boards from the open house. The effort will result in an implementation plan identifying the exact work to be done, sequence of work and how best to accomplish the projects concurrently.